It’s just another day in the San Blas islands. We are in the dinghy, heading out with our snorkel gear to a site we’d heard about called the Hollandes Caves. As we make our way through the gin-clear water of the channel to the shallow back reef, a 4ft wide southern stingray bursts out of the water a few feet ahead and flies effortlessly in front of us for a few seconds before a dip of a wing sends him shooting out of the channel and into the shallow water of the flat. As we approach the reef, the sandy channel ends and we idle along in waist-deep water, watching for coral heads and occasionally sticking a paddle in the water to check the depth. It’s so clear that the dinghy seems to be hovering over the bottom. We toss out the anchor in a sand patch near what we guess is the right location and take in the breathtaking scenery. Towering palms behind the white sand beaches of the nearby islands shimmer in the tropical sun. Head-high waves driven all the way across the Caribbean by the trade winds crash on the reef, sending up walls of spray 50 yards away. Behind the reef, though, there is utter serenity. The only other person visible is a native Guna fisherman in a dugout canoe about a quarter mile away. We gear up and hit the water. It’s pleasantly cool and the visibility is exceptional. It feels like you’re flying over above the bottom. The coral is thriving here, with nooks and crannies everywhere filled with marine life. Anemones sway in the current, and colorful fish flit past. The caves branch out from a narrow crack through the reef. Some lead all the way through to the open ocean, and you can see the light filtering through when you dive down to look into the entrance. Others are dark, making you wonder what’s lurking in the shadows. Schools of multi-colored fish eye us warily from under the large overhangs that line the entrance to the cut in the reef. An octopus poses for us a good 10 minutes before we head back to the dinghy. On the way back to the boat we spot a pair of nurse sharks in the shallow water. One swims along lazily in front of us for some time before they decide they’ve had enough. It is yet another magical day, the kind of experience that you go cruising to have. If you’ve ever dreamed of anchoring behind a reef with palm-fringed islands lined with white sand beaches and crystal-clear water, you may have been dreaming about Panama’s San Blas Islands. Located less than 100 miles from the Caribbean entrance to the Panama Canal, it’s the kind of place where idyllic sunny days with gentle trade winds melt into each other, and you lose track of time. We called on the San Blas in Mermaid, our 51ft double-headsail sloop, after transiting the Panama Canal. Our intention was to stay for around a month before heading to further adventures, but as our cruising plans were open-ended, and we loved the place and the people, we found we just couldn’t leave. The San Blas, or Guna Yala as it’s known in the language of the Gunas, the indigenous population, isn’t far from civilization but has a remote feel. There is only one road to the area, and most of the Gunas live on tightly packed small islands near the mainland. There are very few stores and services available. You can procure basic provisions from a few mom-and-pop stores run by Gunas and a couple of veggie boats. These boats also sell beer, wine and the occasional chicken, and make the rounds of the more popular anchorages about once a week. 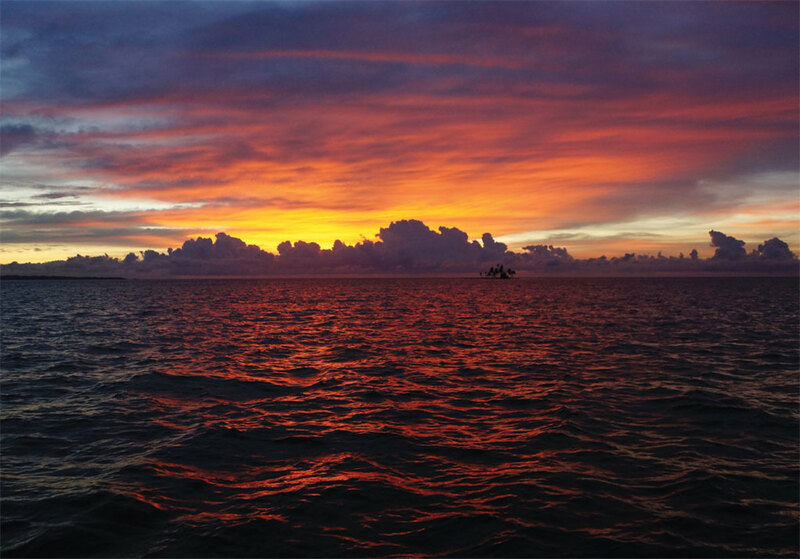 Many of the fishermen will also offer lobster, crab, fish and conch at reasonable prices as they cruise through. The Gunas (known as “Kuna” till some years ago) have a unique culture and until recently have been quite insular. Now, though, modern technology has begun its invasion. Many Gunas have smartphones, and sometimes the glow of television sets can be seen through their windows. It creates an interesting juxtaposition where you find people living in tin roof shacks asking you if you can help them recharge their electronics. Most people’s initial encounter with the locals is someone trying to sell them molas, part of the traditional clothing still worn by many Guna women. 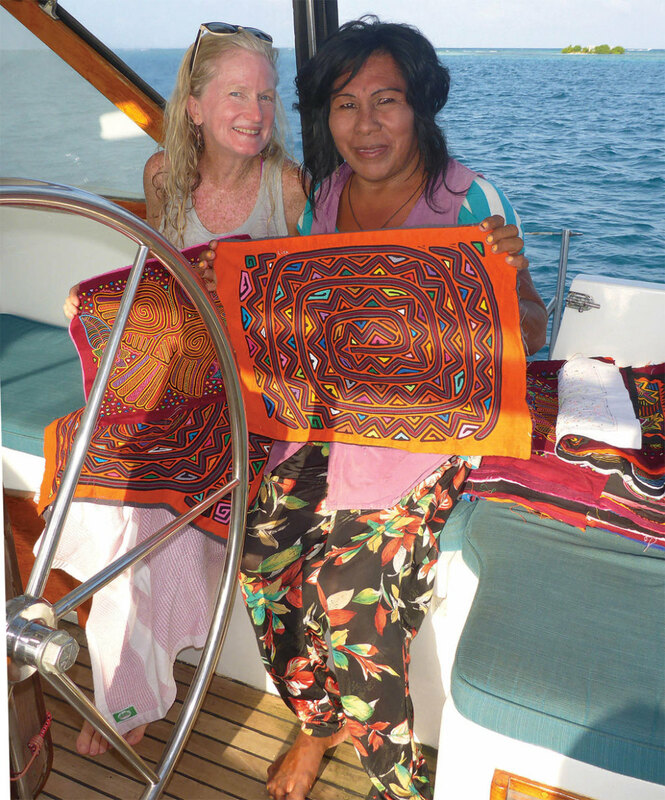 Molas are hand-made using a reverse appliqué process in which multiple layers of cloth are sewn together with portions of the upper layers cut away to create the design. The more layers and the finer the stitching, the higher quality the mola. Soon after we anchored, Lisa, a master mola maker, and well-known transvestite—accepted in the matriarchal Guna culture—pulled up alongside. She climbed into the cockpit carrying two five-gallon buckets of molas. Lisa was friendly and informative as we chatted about the Guna language and culture while slowly making our way through the molas. We purchased a couple as souvenirs and arranged for Lisa to act as a guide for a hike to a waterfall a few miles inland. She is one of the few Gunas we encountered who speaks English. The indigenous Guna language is still overwhelmingly predominant in this region; however, many of the men also speak Spanish. On the appointed day we anchored at Salardup, an island a few miles off the coast, after which Lisa pulled alongside and we climbed into her large dugout canoe, known locally as an ulu, and headed for the mainland. As we neared the bar at the mouth of a river, her assistant called out directions from the bow in while Lisa piloted the ulu through the shallows into a sleepy river crowded by lush green jungle. Passing a group of silently watching Gunas on the bank, Lisa told us they were the chief’s watchers—she had to pay the chief whenever she took anyone to the waterfall. We beached the ulu on a sandbar and headed inland. At first, the trail followed the riverbank where we passed a small Guna cemetery covered by a large roof. Lisa explained it was so the dead don’t have to stay out in the rain. Most of the graves also have a mug on top for the deceased to use in the afterlife, and we paused for Lisa to say a prayer over her mother’s resting place before forging ahead. After that, the trail bent away from the river and steepened as we headed into the highlands, where it started to rain. When the warm, moist air carried by Caribbean trades meets the mountains on the Isthmus of Panama it’s cooled, producing a prodigious amount of rain that sustains the lush and biodiverse rain forests of Guna Yala. The trail soon became muddy and slippery, and we struggled to keep up with our guides who barely seemed to notice the conditions. Finally, the rain stopped as we slogged down a steep incline into a clearing where the roar of a waterfall filled the air. The humidity was oppressive, but the water was delightfully cool as we took the plunge into a clear pool below the falls. A massive rock had fallen just below and after tumbling over the falls the river flows under the rock and into a placid pool. Lisa produced a mask that we used to swim under it, where the falls crash down. It’s Guna Yala magic. The primary cruising ground in the San Blas is surrounded by several major reef systems, separated by deep channels. It’s around 20 miles long and extends around 10 miles offshore. It also offers some 350 islands and hundreds of anchorages to choose from. A handful are popular with cruisers where you can drop the hook if you want to be social, but if you want seclusion there’s always a tranquil spot where you can be the only boat in the anchorage. The cruising community is large and diverse. The proximity to the Panama Canal means many boats from Europe as well as the United States stop in the San Blas before heading through the canal. A core group of cruisers has also decided to make the San Blas their home, with some of them having been there for a dozen years or more. As is sometimes the case, you meet new friends while trying to solve a boat issue, like when our generator stopped charging the batteries shortly after our arrival. Even after long days of tinkering and consulting with others we couldn’t identify the source of the problem and were about to head back to civilization for repairs when we heard about a savvy South African cruiser in a nearby anchorage who might be able to help. Once aboard he pursued the problem like a detective, diagnosing it in minutes, but it wasn’t good news. The pulley that held our camshaft’s timing belt was slipping, and we didn’t have the part to fix it. No problem, though—our South African friend told us he might have something that would work and promised to be back in the morning. Like clockwork, he stepped onboard with a part fashioned from some stock he had on his boat. Soon the generator was purring away. Of course, most of our interactions with other cruisers were of a more social variety, like a potluck on the beach Christmas afternoon, which drew a large, international crowd. In addition to assorted Americans, including a couple from Oklahoma, there were Italians, Norwegians, Portuguese and Brazilians along with a big contingent of Gunas, so that the conversational buzz included several languages. Language barriers aside, though, the smiles and contentment of sharing a meal on a beautiful tropical beach were understood by all. Noticing several Guna children hanging around the edges of the party, we broke out a few small beach toys as Christmas presents. The shrieks and shouts of the kids frolicking on the beach added another happy note to the cacophony and brought a smile to everyone’s face. Our time in San Blas was magical, but we almost didn’t go. Weeks before we’d arrived, rumors were circulating of a dramatic increase in the fees that the Gunas charged cruisers. Prior to our arrival, the Gunas were collecting a monthly fee of $20 per boat and $20 per person. For a cruising couple, this came to $60 per month. Even at this level, the fees were controversial. Some cruisers said the fees were prohibited by Panamanian law, while others said the money collected only went to line the pockets of the chiefs. In any case, the proposed fees of several thousand dollars a month were well outside our budget. After a bit of hand-wringing, we decided to go anyway, and simply leave if the fees increased. Ultimately, when the drama was over the fees didn’t change, and we found that even if it wasn’t legally collected, $2 a day was a bargain for anchoring in paradise. 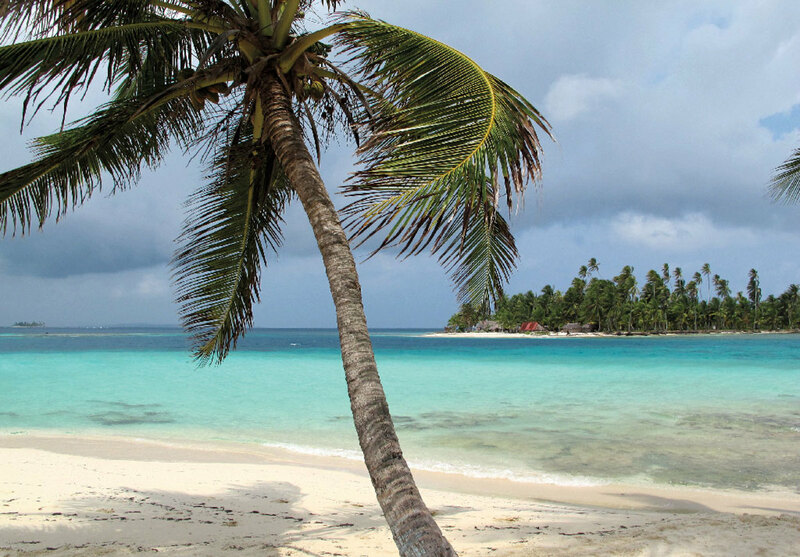 The San Blas Islands don’t have high-rise condos, fancy grocery stores or nice restaurants. You won’t find jewelry stores and trinket shops lining every street, although you will find a local guy who will pull alongside every week or so with a boat full of fresh vegetables, chicken (with head and feet still attached), bread and beer, ready to do business. Just about every day a dugout canoe will paddle by selling fish, crab and lobster. Who knows how long it will stay this way? An occasional cruise ship already calls on Carti, the largest of the coastal cities, and again, smartphones are becoming common even with those living in tin-roofed shacks on the outer islands. Modern civilization is slowly encroaching even as the Gunas’ exotic culture remains strong. For now, if your dream is to anchor off a remote island fringed with palm trees and white sand, where the aquamarine water stretches into the distance, with reef fish abound just behind the waves crashing on the outer reefs, this is where you’ll want to do it. When you drop the hook in the San Blas Islands of Panama you may intend to stay for a few weeks but will probably end up staying for the entire season...or longer.